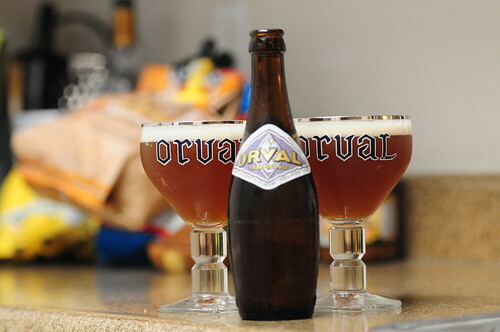 Orval Trappist Ale – Brasserie d’Orval S.A.
Orval Trappist Ale – Brasserie d’Orval S.A., originally uploaded by adambarhan. A: Amber orange in color with a good amount of head that lingers forever. S: The nose is yeasty and very funky, prominent horse blanket smell as well. T: Slight tartness, yeast and that subtle barnyard/wet hay funk. Perfectly balanced malty/hoppy/sweetness. M: Light body, high carbonation finished very dry. D: One of the best beers all the way around. Very good and pairs well with a lot of things.